There is growing concern amongst residents of Southport regarding the shortage of hospital beds and the threat to Adult Social Care services in our town. One resident, Dee Willis told Janet Harrison, Labour Candidate for Kew Ward of the distressing situation regarding her elderly mother in law who was admitted to Southport and Ormskirk NHS Trust. Due to the lack of beds she was left to suffer in excruciating pain for eight hours on a hospital trolley in a corridor. Dee said, “Each afternoon after visiting her, in the corridor there were elderly and sick patients waiting to be taken home. There must be thousands of stories like this, all over the country, but at Southport Hospital, over a few days, I’ve heard more horror stories to keep me awake for weeks. I cannot fault the overworked staff as they do their best to care for so many sick people, for whom there are simply not enough services. It is the fault of the government because they won’t spend on the NHS”. Janet commented, “This is an appalling situation that is taking place on our doorstep. We all know about the NHS crisis and the lack of investment by this government who seek to tender our healthcare services out to private companies whose main aim is to put profit before care. Spending on social care for the elderly has been cut by 17% whilst our elderly population has increased by 10%”. She further added, “Many elderly patients are fit for discharge in our hospital but because social care has been cut they have to stay until a care package can be arranged. Our elderly residents, many of whom moved to Southport to retire to have a full dignified, happy and comfortable life deserve better than this”. Janet will continue to campaign against these cuts and will also be writing to our MP John Pugh to urge him to take more action with regard to the situation at Southport and Ormskirk NHS Trust. She will also ask him to clarify his position regarding the cuts to Adult Social Care and the effect this is having on our elderly residents. She would also welcome your views and comments. You can contact Janet at southportlabour@live.co.uk. 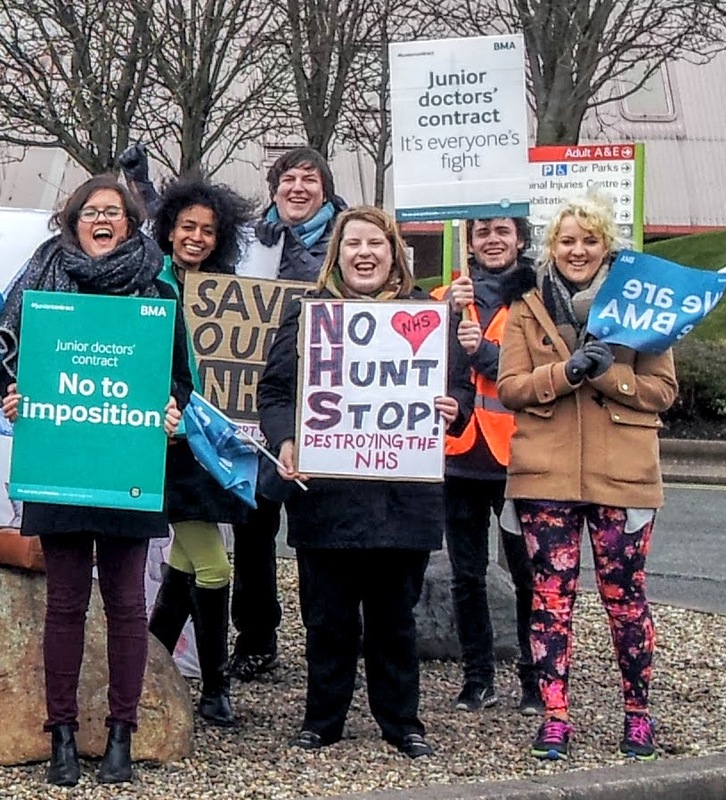 Photo: Janet supporting the Junior Doctors in defending the NHS.